In this document the general search options are summarized and their usage is shown in different search interfaces. Sets different search options according to a predefined search type. For full explanation see detailed description of search types . MolSearch APIIt can be specified as a constructor parameter of the search options object. Default search type is SearchConstants.SUBSTRUCTURE. JChemSearch APIIt can be specified as a constructor parameter of the search options object. na: superstructure search fingerprint-only (returns the result of the fingerprint screening without performing an atom-by-atom search). This option is available only when the jc_compare operator is evaluated as part of a domain index scan. Option can be specified on Query>main options tab by selecting Search type. 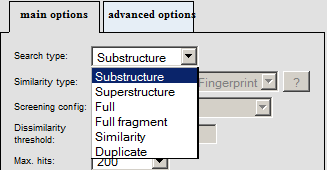 Default value is "Substructure". Specifies whether the same set of target atoms found in a different order should be considered as a different hit. to targetAtoms only AND queryAtoms must match to targetAtoms, etc. If this is impossible, the search methods will report no matching. The use of this method makes the search more effective than checking the hits afterwards. jcsearch command line toolNot applicable. Option ensuring that upon the findNext() call the first atom must be stepped as well. Option is considered only in case of searching a recursive SMARTS query. Sets standardizer object to be used for the query and target molecules, Chemical Terms configuration and re-standardization of query tautomers at tautomer searching. Default is no standardization, but query standardization is always switched on at tautomer search. See detailes of standardization in Standardizer manual. JChemSearch APIThis is not a search option for JChemSearch, but can be specified as table property. See details here. -S "file name" / "action string"
--standardize "file name" / "action string"
Default option is: -S 'aromatize'. Set -S '' to skip standardization. Specifies whether the search is aborted on error or continues searching on error finding and returning as many hits as possible. Halt on error option controlls the handling of record-wise, target dependent errors. In case of general errors: incompatible query, query - search option pair or license error the search is always stopped. Default value in case of Markush tables is HaltOnErrorOption.NO or n (do not halt on error), while in case of other table types HaltOnErrorOption.YES or y (halt on error). It can be specified as a constructor parameter. Default parameter is HaltOnErrorOption                .DEFAULT.